The in-home baby camera includes a temperature monitor, automatic night vision, and a sound-activated screen. At its core, a baby monitor serves one function: to let you remotely listen to—and in the case of modern models, see—your infant or toddler in another room, so you can ensure their comfort and safety. VTech seems intent on making sure parents are armed with an array of tools to do that, offering monitors that do everything from play lullabies to send video streams directly to your phone. The VM2251 is one of its latest, a camera that includes advanced features such as room-temperature monitoring and a sound-activated display. It's available in single- ($79.95) and two-camera ($99.95) packages. 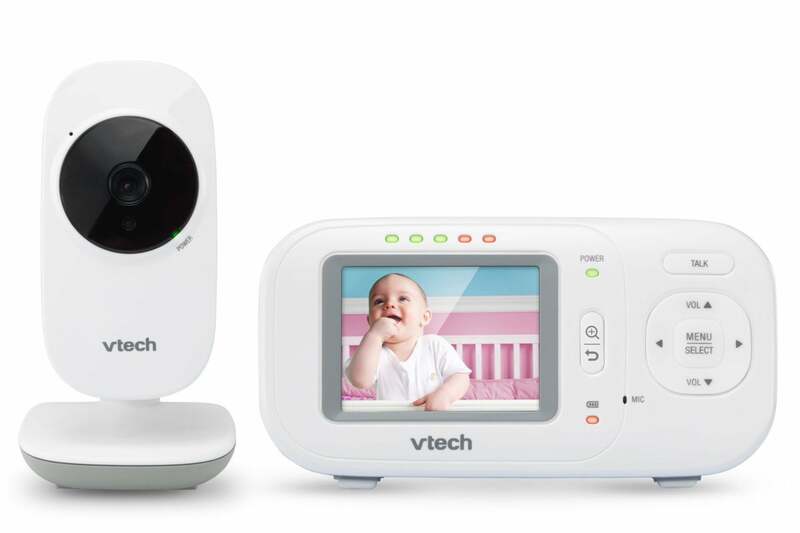 As with the the other VTech baby monitors we’ve reviewed, the VM2251 consists of a camera and a handheld video display called the parent unit. The camera is extremely lightweight and comes attached to its stand. The camera module can be tilted a few degrees up and down on the stand’s ball joint and rotated to a full horizontal position in either direction. A speaker, through which you can speak to your child, is on the back of the camera along with its power jack. A small indicator light on the front beneath the lens glows green when the camera is on, but it's not nearly bright enough to disturb a sleeping baby. A power switch on the side of the camera lets you turn it on and off. The VM2251 comes in one- and two-camera packages, each including a parent unit monitor. The base station feels considerably sturdier than the camera itself. It includes a rechargeable battery, so you can carry it with you around the house, or you can plug it into an outlet and set it on a table using the extendable stand on its back. The 2.4-inch color LCD screen takes up most of the unit's face. Five LEDs above that display the current sound level in the nursery, and are power and battery-life indicators, a 2x zoom button, a talk button, and a built-in mic for two-way audio. Four-way directional buttons let you navigate menu items and control the volume of the parent unit’s speaker. 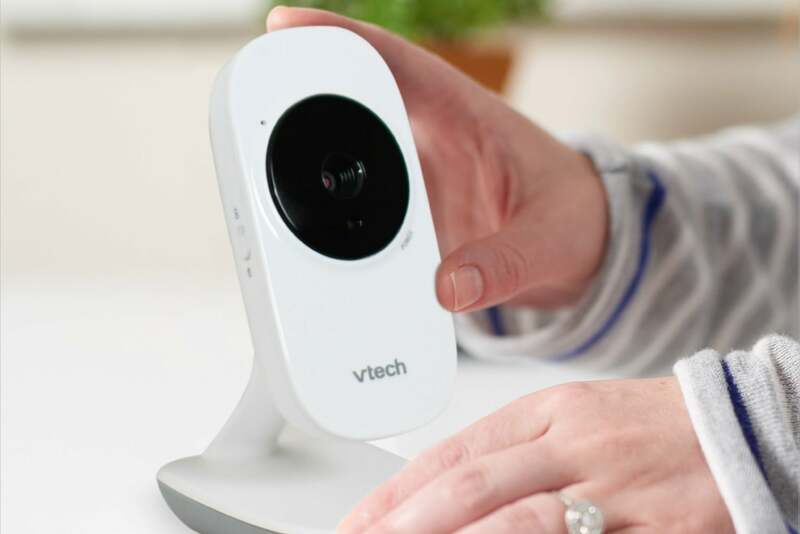 When I reviewed the VTech VM5271 baby monitor, I remarked how simple it was to setup. The VM2251 is every bit as turnkey. My base station came with the rechargeable battery installed and fully juiced, so all I had to do was plug it in, then the camera, and the two were connected and displaying an image. Most parents will probably just set the camera on a table or shelf, but there is a wall bracket integrated with the bottom of the stand. You must insert a pair of screws (not included) in a wall until about 1/4 inch of each is exposed. Then you line up the bracket and slide it down until it locks in place over the screws. Given its small degree of tilt, you’d need to mount the camera fairly high on a wall adjacent to your child’s crib or bed to get a clear view. The VM2551’s display isn’t very big—it’s less than half the size of the VM5271’s, but it’s enough to accommodate a fairly close-up view of your baby. You can get an even closer look with the zoom button. Like the VM5271, the video quality is good, but not great, with a fair amount of noise that’s visible even from a few feet away. This likely won’t be an issue for most parents—monitoring your baby’s movements doesn’t really require HD resolution—but it can be taxing on the eyes if you stare at the screen for long. The VM2251 baby monitor camera can be tilted and rotated for better viewing angles. When the base station is powered on, it displays status icons for the current signal strength from the camera, the number of the camera being viewed (if using multiple cameras), night vision (when activated) the current temperature in your child’s room, and the charge level of the base station’s rechargeable battery. When you adjust the parent unit’s speaker volume, a five-level volume indicator displays over the video. The default level is three, which I found just about right for a quiet room. A mute alert will display if the parent unit’s speaker volume is turned all the way down. Parents will probably love the VM2251’s sound-activated screen most of all. The base station's display stays off to conserve power until it hears a sound. When it does, the display automatically turns on and remains on until it doesn’t detect noise for 50 seconds. The feature worked pretty reliably. You can adjust the the sound sensitivity level on a scale of 1 to 5 in the settings menu: At detection level “1,” according to VTech, the base station will turn on only for your baby’s loud cries or screeching, while a level “5” setting will allow parents to hear pretty much any sound in the child’s room. Sound activation can also be turned off. If you want to keep the ambient temperature of you nursery at a desired level, you can set a high and low range. If you do, a warning icon displays whenever the detected temperature falls out of that range. You can also activate an alert tone to sound when this happens. The VM2551 is a reliable, easy to use baby monitor for making sure you child is secure and comfortable in their room. Though it’s strictly an in-home monitor, it does have a range of 1,000 feet, which in my tests was enough for me to stay connected to the camera even when I was in the yard or outside around my home. That’s probably plenty for most parents. If you want something that lets you keep tabs on your little one when you’re away from home as well, check out the Arlo Baby. 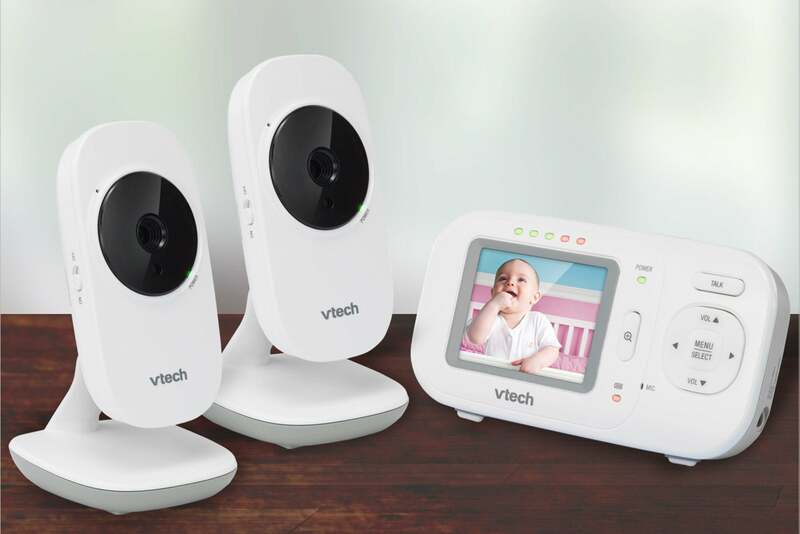 The VM2251 is a capable baby monitor with some advanced features that will likely delight new parents.